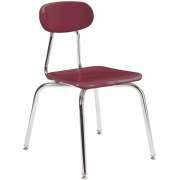 At Hertz Furniture you'll find durable classroom chairs for students of all ages. We offer a broad range of models, colors, and materials. With our extended or limited lifetime warranties, your students will use our school chairs for many years to come. 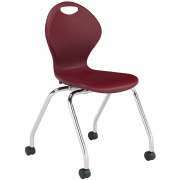 Where can you get ergonomic school chairs? 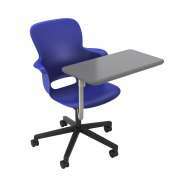 Finding ergonomic classroom seating can be quite a challenge. You must take budget, decor and layout into account, while making sure that the school chairs you choose will provide proper support to students. With our excellent selection, you can rest assured that every model is designed for maximum durability and comfort. 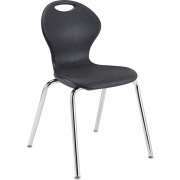 What kind of school chairs should I get? The material of the chair seat and back is ultimately what determines price, durability and support. 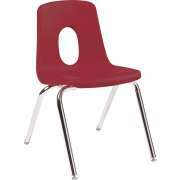 Hard plastic school chairs are super durable. They are scratch- and stain resistant so they will withstand virtually anything your students can throw at them. Polypropylene seats are another excellent option. 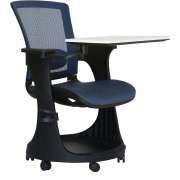 Their contoured one-piece seat design promotes proper positioning throughout the day. Both of these options are supported by sturdy high-gauge steel frames. 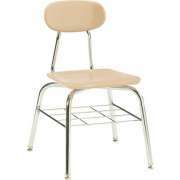 Can I get wooden chairs for the classroom? Natural wood furniture is known for its strength and unique style. 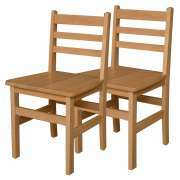 We have many solid wood chairs to choose from which will fit in well in a preschool or daycare classroom. Bentwood chairs from ECR4Kids combine a classic wood appeal with a modern curved design for a unique appearance and ample seat. Ladder-back wood chairs from Georgia chair have a classic design that is perfect for a reading corner or other calming space. 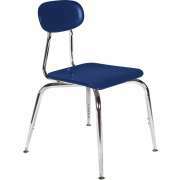 Tired of adjusting school chairs and tightening screws? Concerned about the hazards of loose connections? Resin preschool chairs from ECR4Kids have a unique design which features one-piece construction. With this excellent arrangement, there is no hardware to tighten - ever. 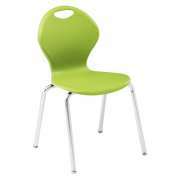 Resin preschool chairs are also full-color so they can really add a lot to a drab room. What is the best color for preschool chairs? No matter what style or material of classroom chair you choose, you will have to decide on your ideal hue. All of our models are available in a huge selection of shades which can be coordinated with your current classroom colors. Alternatively, you can use student chairs as a way to bring in complementary hues which will brighten up and add excitement to a learning space. Although the typical school chair models are all great choices, the truly modern and up-to-date educational environment requires something more innovative. Academia’s Inspiration chair line has a distinctly contemporary feel which comes from curved styling and attractive materials. 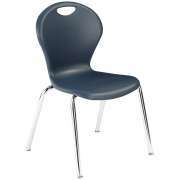 These classroom chairs feature ergonomic construction for optimal leg and back support. They have 17 reinforcement ridges in the back for maximum flexibility which allows children to lean back in their seats without damaging chairs. For an extra hint of hue, they are also available with matching boot glides. Not all chairs have the same support system. 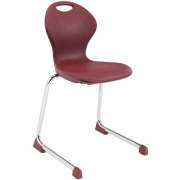 We carry models with various leg styles so you can choose the configuration that best suits your student population. Cantilever legs leave more open space under the seat. Sled bases are ideal for carpeted floor because they will not damage rugs when they are dragged or moved. 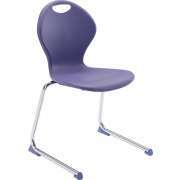 If you find the sound of sliding chairs to be distracting during lessons, chairs with casters can easily slide in and out of position without making too much noise. 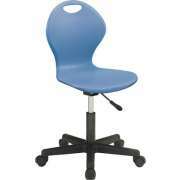 We also have swivel chairs for those who want maximum mobility in the seated position. 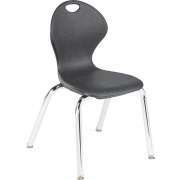 How do I know what size school chairs to get? Once you have determined the seat material, support arrangement, color and style of your ideal classroom chairs, there is one more element that must be taken into consideration. Children of different ages and sizes need seats of varying heights in order to sit properly and comfortably. When ordering school chairs, be sure to verify that they are of the correct height for the age and grade range of your students. 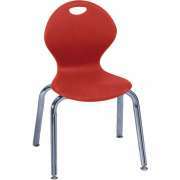 We carry chairs that are appropriately-sized for preschool all the way through post high-school age. 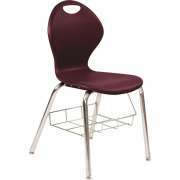 If your educational establishment serves students who are in different stages of growth such as high school and middle school students, it is a good idea to purchase chairs in a number of heights so individuals can sit comfortably even when they are growing at different rates. 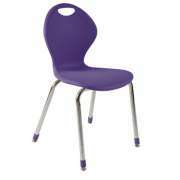 There are a number of additional chair features that can come in handy in a learning environment. Book boxes provide an accessible space for personal classroom materials. Padding can make student chairs much more comfortable. It is worth considering for a setting where students stay in one room for a long time or have lengthy frontal lessons where they are expected to sit down. At Hertz Furniture, we know that having the right classroom furniture is the first step toward creating a productive learning environment. Our school chairs are designed to support you students properly and look great through many years of learning and growth. With the right classroom chairs from Hertz Furniture, you can show students just how much physical comfort can facilitate improved study habits.